SAN SALVADOR, Nov 02 (IPS) - Disconsolate, Alberto Flores piles up on the edge of a road the few bunches of plantains that he managed to save from a crop spoiled by heavy rains that completely flooded his farm in central El Salvador. "Everything was lost, I have been cutting what can be salvaged, standing in water up to my knees," said Flores, a 54-year-old peasant farmer from San Marcos Jiboa, a village in the municipality of San Luis Talpa, in the south-central department of La Paz. The damage was mainly to chili peppers, maize, beans, bananas, pipián - similar to zucchini - and loroco (Fernaldia pandurata), a creeper whose flower is edible and widely used in the local diet. Central America has been described in reports by international organisations as one of the planet's most vulnerable regions to the onslaught of climate change. 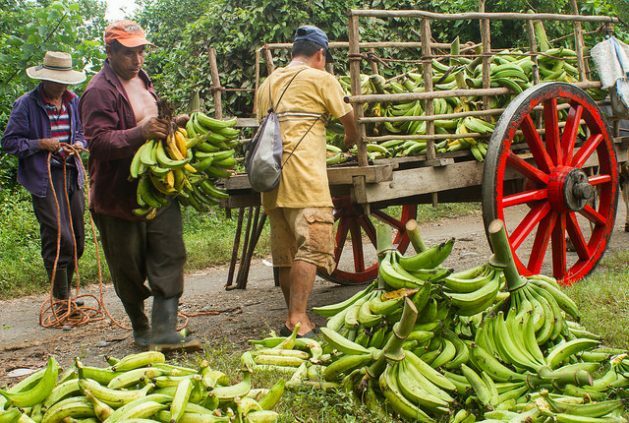 "I've heard about agricultural insurance, but no one comes to explain what it's about," said Flores, who perspires heavily as he piles up clusters of green plantains. "Basically, it's expensive," Saúl Ortiz, Guate Invierte's Risk Analysis and Management Coordinator, told IPS by telephone from Guatemala. The financial institution manages a trust fund of more than 70 million dollars in agricultural support in various areas, including insurance. It is precisely because of these costs that Guate Invierte emerged in 2005, added Ortiz, to support the country's small and medium producers and give them the chance to take out a policy. The initial plan was to extend it throughout the region. It is a microinsurance scheme aimed at the bank's portfolio of 50,000 clients, whether they are farmers or involved in other productive sectors. Unlike traditional insurance policies, which in the event of a catastrophe only pay for physically verified crop losses, Produce Seguro offers "parametric" insurance. The higher the level of rainfall in the policyholder's area, the higher the indemnity. "We don't have to do any verification in the area, everything is based on the charts," Daysi Rosales, general manager of Seguros Futuro, told IPS. As a result of the last downpours, "the parameters have already been met and some level of compensation will be made, although we haven't paid yet because the event just occurred and we are processing the payments," said Rosales. "In Mexico, 90 percent is paid by the State; it is the State that buys the insurance, not the people," said Rosales. "This time the blow was twofold: first we lost our maize in August, to drought, and now I've lost almost my whole loroco crop because of the rain," he added. Now that his maize harvest is ruined, Alcantara said he will have to figure out how to put tortillas on his family's table.